It’s a new day in America. Today, more people will go to work, return home to their families and sleep more soundly than ever before. All because one man refuses to settle, putting people before politics. That man is Frank Underwood. 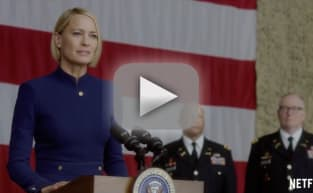 Netflix found a creative way to announced the Season 4 premiere date for House of Cards on Tuesday night, running the following fake campaign ad for its most popular show as part of a commercial break during the Republican Presidential Debate. House of Cards Season 4 will be available for streaming (in its entirety, per usual) on March 4, 2016. This is the latest the drama has ever premiered, with Kevin Spacey and company typically coming back into our lives in February.